The first thing that come to your mind when you mention Madam Patisserie is of course Pastry. Burger, Shepherd's Pie or Teriyaki Salmon will hardly come across your mind. This time around I receive an invitation from HungryGoWhere on behalf of Madam Patisserie to sample their new bistro menu. The co-owner and head pastry chef for Madam Patisserie is Miss Sherie Quek. A renown pasty chef in her own rights with more than 10 years experience in Ritz Carlton Hotel. The décor of this place has simple yet elegant look. The colour combination of baby blue, tangerine and white just astonishing. 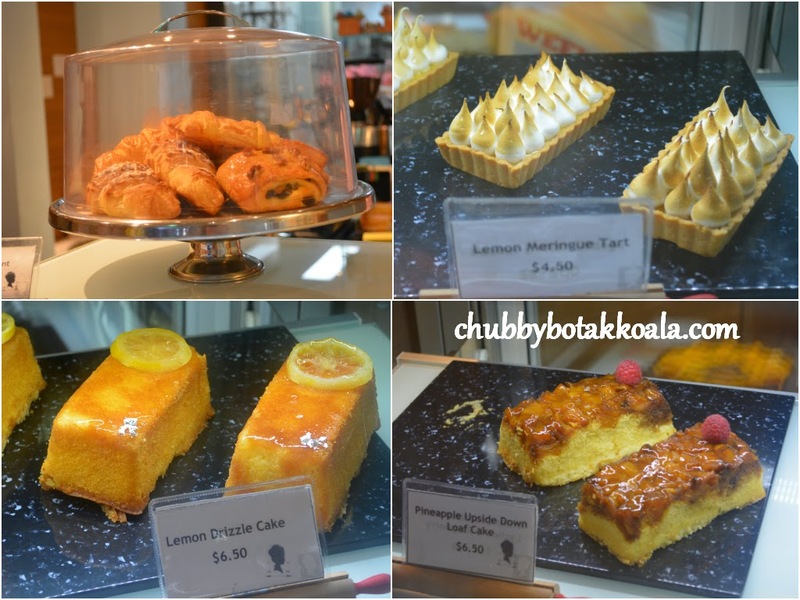 When you enter the shop, you will be bedazzled with the pastries selection such as pineapple upside down cake, lemon drizzle cake, Lemon Meringue Tart, sample of High Tea set and croissants. For seating, you can choose for indoor and outdoor seating. My suggestion is go for the outdoor seating, under the tent. The scenery is just fantastic, as it is facing the Singapore river. Seating on the astroturf, create a feeling that you are seating in your own backyard. For the indoor seating, go for the comfortable couch, however try not to sit opposite the coffee machine, as the spot light are just too bright and made the atmosphere too warm speaking from the experience of my second visit. We started our sampling from Madame Burger ($14.90) and Teriyaki Salmon ($14.90). The patties of the burger is tender and juicy. The honey oats buns is light and tasty. The pink caramelised onion is just so inviting. Teriyaki Salmon is served with steamed rice. The salmon is perfectly cooked, the teriyaki sauce is quite thick but goes well with the rice and pickled cucumber. For the Shepherd's Pie ($11.90), they use mince lamb for the meat base. The ingredients fillings are quite good, topped with mashed potatoes and mozzarella cheese. It was baked before serving to create the crispy topping. The taste can be slightly gamey due to the lamb. So if you can't take gamey taste, avoid this dish. Their all day breakfast ($16.90) is not something that I would recommend. The dish is just too simple, just like your home cook breakfast. Grilled Ham is just a no no for me, as it is too saltish and kind of a waste though. The best part of this dish is actually the toast, which was soft in the inside with an light crispy exterior. For the high tea menu, they are served on three tier display set. What a spread. You have scones on the first tier, sandwiches on the second tier and desserts on the lowest tier. The scones are moist and compact. Goes well with homemade jam and butter. The sandwich is light and tasty while the desserts is just excellent. The 'sweets' come in different variety and different flavour. After a quick breather, we proceed to the a la carte desserts selection. Pink Indulgence ($18) is my top choice. Trio of strawberry mille feuille, strawberry panna cotta & strawberry granita. The feuile is just thin and light. You can taste the intense flavour of the strawberry in the panna cotta, while the granita was just refreshing. 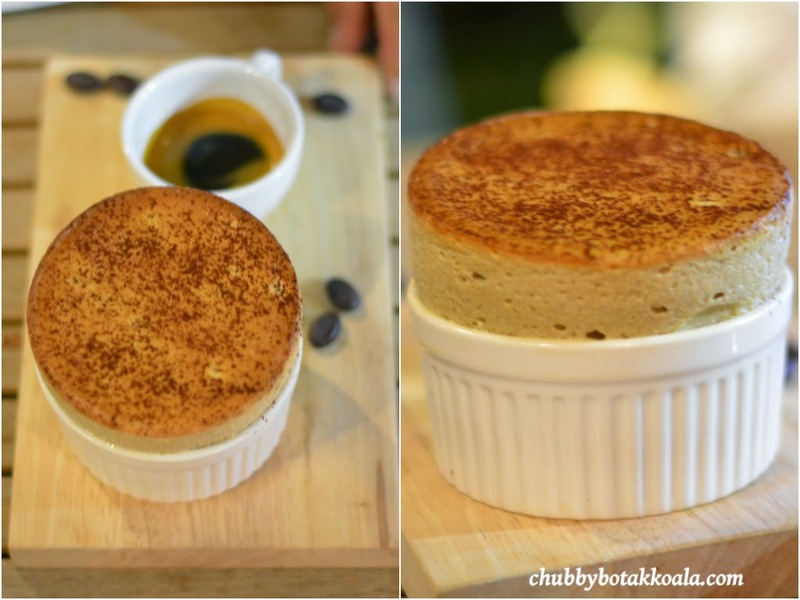 Coffee Soufﬂé ($19) is next on the list. It is light, airy and the shot of espresso from Papa Palhetta is really a cure for coffee addict like us. The Churros ($16) shaped like a bread stick. It is thin and light and well coated with sugar. You can dip it in chocolate sauce or vanilla cream. I personally like my churros in a star shape and with a bit more solid texture. The chocolate sauce can be better if a better quality chocolate are used. During my second visit with Little Devil ('LD') and her BFF ('S'), they both agreed that the churros are too light. During my first visit the Warm Chocolate Cake ($18) was solid and good. During the repeat visit, it seems that although the chocolate sauce was oozing out from the cake, it lack the intensity as compared to the first visit. Same opinion as the chocolate sauce, if darker chocolate are used, I am sure this Warm Chocolate Cake will definitely taste better. For the Apple & Mango Tarte Tatin ($17), the apple is nicely cook. However, we can't taste the mango. The pastry is thin and crispy but not fluffy. Quite disappointing in this last two dish though. For the drinks selection, I tried their chocolate milkshake and latte. The milk shake is just average. Lack of punch of a proper milkshake. The coffee is good, however the milk was not frothed to the right temperature. Service on my second visit, just two words “IMPROVEMENT NEEDED”. We find the service staff's attitude is simply too cold or should I say that they do not seem to be interested in serving us. They never provide us with the appropriate cutlery for our order. Table was not set properly, even serviette was insufficient. The verdict: I personally find that Madame Patisserie is performing below its standard. With a little more fine tuning in different area, it can definitely delivery a memorable dining experience. It is not everyday you find the a la-carte desserts are more expensive then normal a la carte menu. It does show, that desserts here are still the main attraction. Cheers! !